Permanent Lifting magnets are perfect ideal items of lifting gear that make lifting magnetic objects such as steel, easy. An Eclipse Magnetics Ultra Lift Plus Lifting Magnet works with four safety features, the safety catch, the lifting eye, hand brake release and a ‘safety shim’. The safety catch locks the handle in the ‘on’ position to ensure that the load remains secure once activated. The Lifting Eye is an additional safety catch, once tension is applied the mechanism locks the handle to prevent is from flicking backward and dropping the load. A hand brake release button is used to release the load, it can only be used when the magnet is not in operation due to the lifting eye and safety catch. This can easily be operated with one hand. Lifting Magnets are a perfect alternative to big bulky chains and slings, no need to rig up your load, simply drop, load and go! Firstly the load should be Pre-tested, this involves placing the safety shim on the load and lowering the lifting magnet in to place. The magnet is then switched on by rotating the handles 120 degrees anti clockwise. To ensure the load is fully locked in place the user should check the handle is in position correctly and then lift the load a little just to check, if the load is secure with the safety shim in place a 3:1 safety factor is guaranteed by Eclipse! To switch the magnet off the load must be returned to the floor, the safety catch and lifting eye prevent unintentional unloading of the magnet. The handbrake must be removed by clicking the top button on the handle (much like a car handbrake but you have to hold the button down) the user then has to push the handle back to release the load and let go of the button. 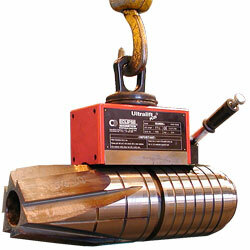 To now perform a lift using the lifting magnet the user should repeat the process without the use of a safety shim. This entry was posted in Equipment Guides and tagged Able, Cranes, Eclipse, equipment, gear, lifting, magnet, magnetic, overhead cranes, steel, technology, yale. Bookmark the permalink.